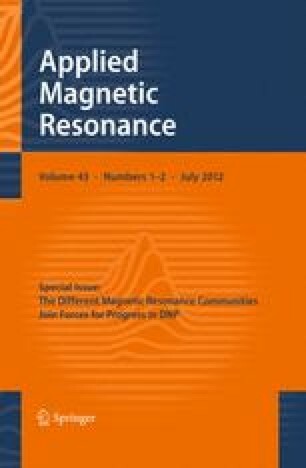 We have performed liquid state (“Overhauser”) dynamic nuclear polarization (DNP) experiments at high magnetic field (9.2 T, corresponding to 260 GHz EPR and 400 MHz 1H-NMR resonance frequency) on solutions of pyruvate, lactate and alanine in water with TEMPOL nitroxide radicals as polarizing agent. We present experimental results showing DNP enhancement on metabolite methyl protons, varying for the different target metabolites. It is shown that the enhancements are achieved through direct coupling between the radicals and the target metabolites in solution, i.e., the effect is not mediated by the solvent water protons. The coupling factors between the TEMPOL radicals and the metabolites observed are a factor of 3–5 smaller compared to direct polarization transfer from TEMPOL to water protons. An erratum to this article can be found at http://dx.doi.org/10.1007/s00723-012-0378-x. This work was supported by the DIP program from the German Research Council (DFG) and the Center for Biomolecular Magnetic Resonance, Frankfurt. We gratefully acknowledge technical support from Dr. A. Krahn and Dr. F. Engelke from Bruker, Bernhard Thiem and the mechanical workshop of the Institute of Physical Chemistry.